Students going to Switzerland* will receive a grant 420 CHF/month (1 mobility = 5 months) from the Swiss government in the frame of Swiss-European Mobility Programme (SEMP). The student has to apply for this grant according to information from the partner university. In case that the Swiss grant counted to Euro and to an exact number of days of the mobility (1 month = 30 days) is less than 500 € per month, the student will receive an additional one-time grant from VSE, in order to equalize the grant. Students going to Russia, North and Latin America, Asia, Australia or New Zealand receive a grant from VSE Scholarship Fund. 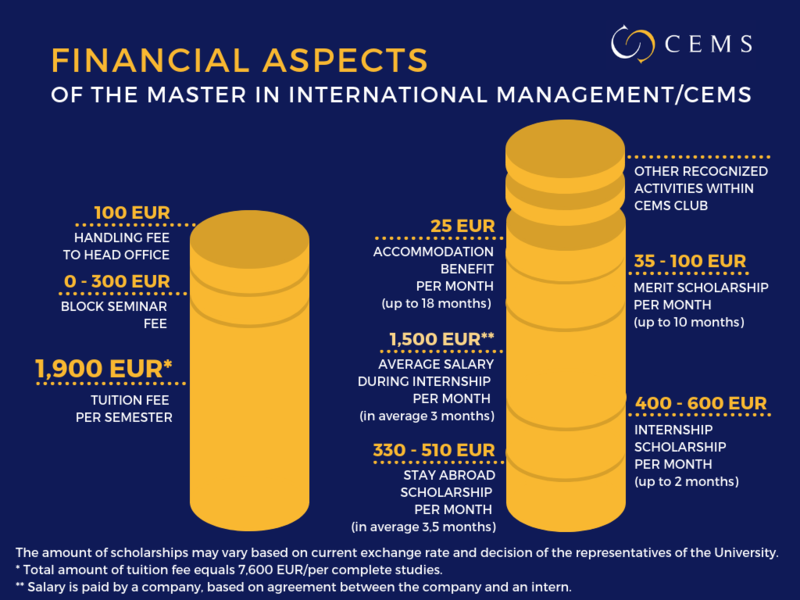 The amount of the grant is 10 000 CZK per month (rounded up to half months). After fulfilling the requirements, students receive financial support for a maximum of 8 weeks (2 months) of the internship. If the internship lasts longer, the student is for the remaining months classified as a “zero-grant” student. The amount of grant varies according to the country of the internship. Students who plan to undergo their internship outside the EU may apply for a grant from VŠE´s Stipend fund. The grant is a fixed amount and makes 15 000 CZK (approx. 600 EUR). The deadline for submission of the Scholarship application form is October 15, 2018.